Stafford County is a county located in the Commonwealth of Virginia. It is a suburb outside of Washington D.C. It is approximately 40 miles south of D.C. As of the 2010 census, the population was 128,961. Its county seat is Stafford. The Stafford County Courthouse in October 2013. Located across the Rappahannock River from the City of Fredericksburg, Stafford County is part of the Washington-Arlington-Alexandria, DC-VA-MD-WV Metropolitan Statistical Area. In 2006, and again in 2009, Stafford was ranked by Forbes magazine as the 11th highest-income county in the United States. The Native Americans' first recorded encounter with Europeans in this area was in 1608, with John Smith of the Jamestown Settlement. During a time of recurring tension between the early English colonists and local Native Americans, the colonists led by Samuel Argall captured Chief Powhatan's daughter, Pocahontas, while she was living with her husband, Kocoum. The colonists took her from the eastern part of this county, to a secondary English settlement, known as Henricus (or Henrico Town). Alexander Whitaker converted Pocahontas to Christianity during her captivity. He renamed her as "Rebecca" at her baptism. Rebecca/Pocahontas married English colonist John Rolfe on April 5, 1614 in Jamestown. Their mixed-race descendants were among the First Families of Virginia. The English colonial government of Virginia imposed its own order on the land and peoples. In 1664 it established Stafford County from territory previously part of Westmoreland County (which had been created from Northumberland County in 1653). It was named after Staffordshire, England. As originally delineated, Stafford County included a much larger area than its current borders. As population grew, the following counties and jurisdictions were created: Arlington, Fairfax, and Prince William counties, and the City of Alexandria. 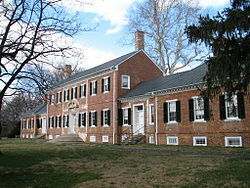 It is part of the area now considered Northern Virginia. Aquia Church, built in 1757, is unusual among local structures for having been designed on the plan of a Greek cross rather than the more standard Roman Cross design. In addition, Aquia Church has a rare three-tiered pulpit; it has been designated as a National Historic Landmark. The Episcopal church continues to be active today. During the American Civil War, the county was part of the battlegrounds, occupied repeatedly by more than 100,000 troops for several years. In 1862, before and after the Battle of Fredericksburg, some 10,000 African-American slaves left area plantations and city households to cross the Rappahannock River, reaching the Union lines and gaining freedom. This exodus and Trail of Freedom is commemorated by historical markers on both sides of the river, in Fredericksburg and in Stafford County. The Battle of Aquia Creek took place in the Aquia Harbour area. Both the Union Army and Confederate Army struggled to control the strategic Potomac Creek Bridge at various times during the war. Falmouth, a town bordering Fredericksburg, was the home of late-19th century American Impressionist artist Gari Melchers. His house, Belmont, still stands and is listed on the National Register of Historic Places. Stafford County has developed as part of the Washington, D.C. metropolitan area, the seat of government and numerous major defense installations. Marine Corps Base Quantico, primarily in neighboring Prince William County, occupies northern areas of this county. Many residents commute north to work there and in other defense and federal facilities, as well as private companies, in Washington, DC and its environs on Interstate Highway 95, U.S. Route 1, and by Virginia Railway Express. In the early morning hours of May 9, 2008, a tornado touched down in the southern part of the county, severely damaging about 140 suburban homes. The county was severely affected by "Snowmageddon," the massive blizzards of December 2009 and February 2010. Stafford received some of the heaviest snow in the D.C. metropolitan area, with about 25 inches of snow in December, and 19 inches in February. According to the U.S. Census Bureau, the county has a total area of 280 square miles (730 km2), of which 269 square miles (700 km2) is land and 11 square miles (28 km2) (3.9%) is water. The Potomac River flows along part of the eastern border of the county, while the Rappahannock River runs along the extent of the county's southern border. The independent city of Fredericksburg developed at the fall line of the river, supporting mills run by water power. To the northwest of there is the Piedmont area. Aquia Creek empties into the tidal segment of the Potomac River at Brent Point in Stafford County. The county is divided into seven magisterial districts: George Washington, Hartwood, Falmouth, Griffis-Widewater, Aquia, Garrisonville, and Rockhill. The magisterial districts, roughly equal in population, each elect one supervisor to the Board of Supervisors which governs Stafford County. The County operates under the county form of the County Executive system of government, with an elected Board of Supervisors. The Board hires a professional, nonpartisan County Administrator to manage government agencies. The current County Administrator is Thomas C. Foley. Stafford County is represented by Congressman Rob Wittman in the U.S. House of Representatives. On the state level, it is represented by Republican Bob Thomas and Democrat Jennifer Carroll Foy in the Virginia House of Delegates. As of the census of 2010, there were 128,961 people, 38,237 households, and 24,481 families residing in the county. The population density was 342 people per square mile (132/km²). There were 31,405 housing units at an average density of 116 per square mile (45/km²). The racial makeup of the county was 72.5% White, 15.6% African American, 0.4% Native American, 2.8% Asian, 0.10% Pacific Islander, 3.2% from other races, and 4.0% from two or more races. 9.2% of the population were Hispanic or Latino of any race. By 2005 Stafford County's population was 72.8% non-Hispanic whites. African-Americans were 17.0% of the total population. Native Americans were 0.4% of the county total, Asians 2.3%., and Native Hawai'ians and other Pacific islanders 0.2%. Stafford County has one of the highest percentages of this ethnicity in the US outside Hawai'i. Latinos were 6.4% of the population. This was higher than the total for all of Virginia, but below their proportion in the counties to the north. As of 2000 there were 38,187 households out of which 46.90% had children under the age of 18 living with them, 68.00% were married couples living together, 9.30% had a female householder with no husband present, and 18.90% were non-families. 13.80% of all households were made up of individuals and 3.40% had someone living alone who was 65 years of age or older. The average household size was 3.01 and the average family size was 3.32. In the county, the age distribution of the population shows 31.60% under the age of 18, 7.80% from 18 to 24, 33.70% from 25 to 44, 21.10% from 45 to 64, and 5.90% who were 65 years of age or older. The median age was 33 years. For every 100 females, there were 101.10 males. For every 100 females age 18 and over, there were 99.50 males. The median income for a household in the county was $75,546, and the median income for a family was $78,575 (these figures had risen to $85,793 and $95,433 respectively as of a 2007 estimate). Males had a median income of $47,080 versus $31,469 for females. The per capita income for the county was $24,762. About 2.40% of families and 3.50% of the population were below the poverty line, including 3.30% of those under age 18 and 5.30% of those age 65 or over. ^ "John Rolfe Highway Marker". Archived from the original on 24 July 2012. Retrieved 9 June 2016. ^ "Kidnapping of Pocahontas Marker". Retrieved 9 June 2016. ^ a b "Stafford County Virginia Records". Retrieved 9 June 2016. ^ "Colonial Forge School Improvement Plan Report" (PDF). Colonial Forge High School (See page 4). Retrieved 2007-09-04. ^ Connor Jr., Albert Z. (2003). A History of Our Own, Virginia Beach: The Donning Company Publishers. ^ Krishnamurthy, Kiran (30 September 2002). "Sandstone in Washington Buildings came from Island on Aquia Creek". The Baltimore Sun. Retrieved 1 August 2016. ^ "Battle Summary: Aquia Creek". Heritage Preservation Services. 2014. Retrieved 2014-02-07. ^ Laris, Michael; Davis, Aaron C. (May 10, 2008). "Area in 'a Daze' After Tornadoes". The Washington Post. Retrieved 2008-05-10. ^ "2008 TORNADO COVERAGE". Fredericksburg.com. 2008. Archived from the original on 2014-02-23. Retrieved 2014-02-07. ^ "Monster snow storm top story for 2010: Record snowfalls was top local story of 2010". Fredericksburg.com. December 31, 2010. Archived from the original on February 23, 2014. Retrieved 2014-02-07. ^ "Snow blizzard hits Washington D.C., Maryland and Virginia". CNN. December 19, 2009. Retrieved 2014-02-07. Wikimedia Commons has media related to Stafford County, Virginia. Wikivoyage has a travel guide for Stafford County.